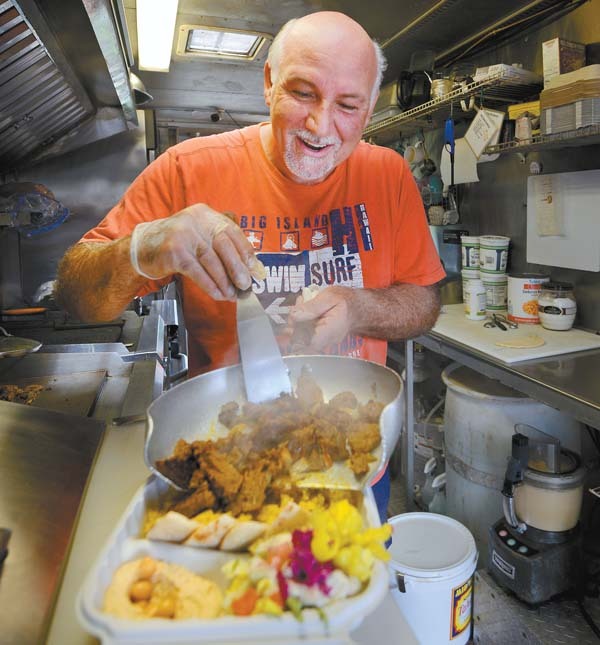 Mediterranean Grill owner Rick Catib assembles a lamb gyro platter Friday morning in the food truck parked at Haiku Cannery. Catib said he and wife Vessi and cousin Sam Ballout have earned an award-winning reputation serving up Lebanese-inspired cuisine during their four years in Haiku. “Food has always been a passion for my wife and I,” Catib said. “It’s homestyle cooking and a family-operated business. We take our time preparing our food. Like our spices — they are shipped fresh from Lebanon, not something that has been sitting for months in a can.” Catib said the business has expanded to include catering.